Trying out a new feature this week. 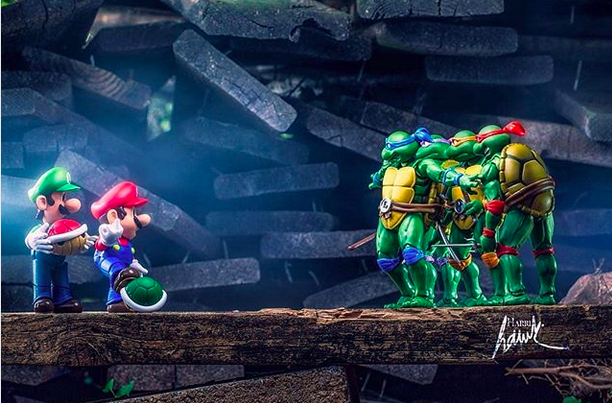 “Toy Chest Theater” will spotlight some of the best toy photography out there. (I reserve the right to be subjective in my picks, of course.) Our inaugural edition features an image by James Gibbs of Harri.Hawk Toy Photography. The premise here is, of course, a funny one. These six-foot tall Turtles are taken aback by these little men who happen to kick turtle shells around. But what really makes the image work is the way Leo is posed. The way I read it, he’s holding his brothers back, trying to keep them from rushing into a threatening scenario. And you know what? Maybe it is a threatening scenario. Those Mario Bros. have been known to throw friggin’ fireballs, after all. Not to mention those invincibility stars. Either way, the image isn’t nearly as funny if the Turtles are battle-ready. This entry was posted in Toy Chest Theater and tagged action figures, Donatello (TMNT), Harri.Hawk Toy Photography, James Gibbs, Leonardo (TMNT), Luigi, Michelangelo (TMNT), Ninja Turtles, Raphael (TMNT), Rob Siebert, SH Figuarts, Super Mario, Super Mario Bros., Teenage Mutant Ninja Turtles, TMNT, Toy Chest Theater, toy photography, toys on 09/06/2018 by primaryignition.